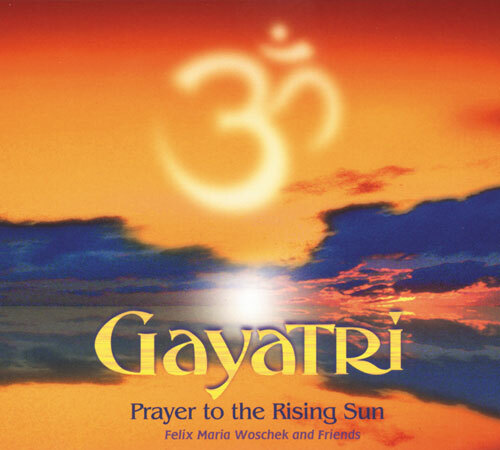 The Gayatri mantra is one of the best-known and most frequently sung of all mantras. It is a mantra of inner purification, and a hymn to the Light of God. Felix has recorded a very meditative and aura-laden version here, which is ideally suitable for an hour of meditation. Devotees of mantra singing will be most enthusiastic, but so also will all those be who want to be transformed into a meditative state with the aid of music. May the external world, the world of my senses be purified. May the internal world, the world of my spirit be purified. May the subtle world, the world of my soul be purified. Praise be to the great spirit that enlightens my inner being and all the world. Let me meditate upon Your divine light and effulgence until my limited consciousness becomes one with you. There are three times of the day when it is best to recite the Gayatri Mantra: sunrise, noon and sunset. It is also very god to chant the mantra while taking a shower and before eating. This will clean all your three bodies and your food from every negative vibration and protect yourself through raising your energy-level. keyboard and flute to didgeridoo. It’s deeply mystical but also as familiar as a half remembered dream, a beautiful call not just to the dawn, but to the deep areas of the soul that connect us to each other and to all history. Starting out with sitar, ringing tamboura, and spine-tingling chimes, the hour-long „prayer“ expands outward into the divine on giant, slow buzzing Tibetan singing-bowl drones that vibrate through the soul, looking for dark spots to enlighten. A giant unearthly didgeridoo (by Kailash) comes rolling, and flutes howl off in the distance like the call of hawks slowly melting into rays of the setting sun. Eventually night approaches, and gusts of wind and crashing waves open up the mind to exhilaration and centeredness. the long extended vowels of Gayatri. Meant to be listened to for its full hour-plus length, it’s perfect. Felix Maria Woschek believes in productions that are both elaborate and inspired. He is also proverbially able to carry the growing number of visitors to his concerts away with him. The many enthusiastic and grateful letters he receives show that he is able to give people something important with his music and performances. His interpretation of the Gayatri radiates an intense calm, emphasised by soft instrumentation (including a didgeridoo by Kailash). The more often you hear it, the deeper the impression it makes on you. A milestone and a door-opener to the divine element within you. This CD is ideal for meditation and simply to relax and feel peaceful. It is my favourite CD for yoga nidra.